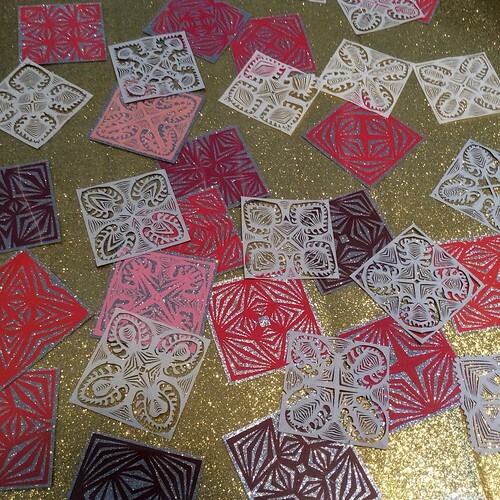 I bet you've heard of kirigami and perhaps have even tried it... fold and cut construction paper snowflakes are a popular project in elementary school. 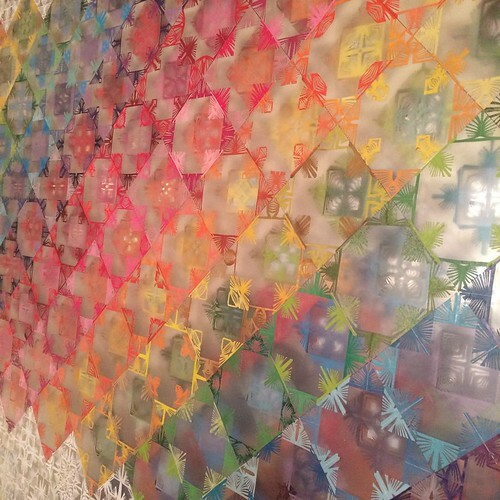 New York City artist Chelsea Hrynick Browne [edit: site no longer available] takes the technique to a new level by folding, cutting, then cutting apart, and layering hundreds, if not thousands, of upcycled and origami paper squares. 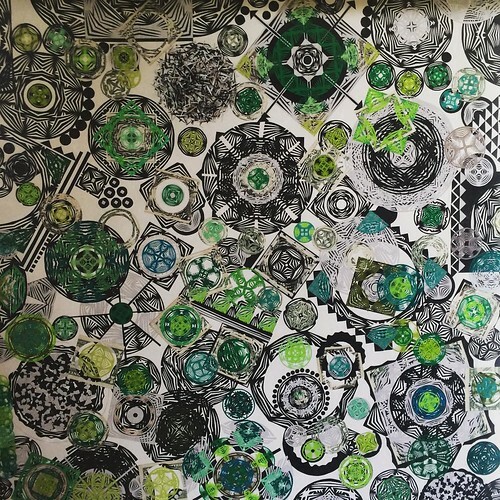 She creates abstract collages and large-scale installations that range from ethereal moodiness to updated pop art. 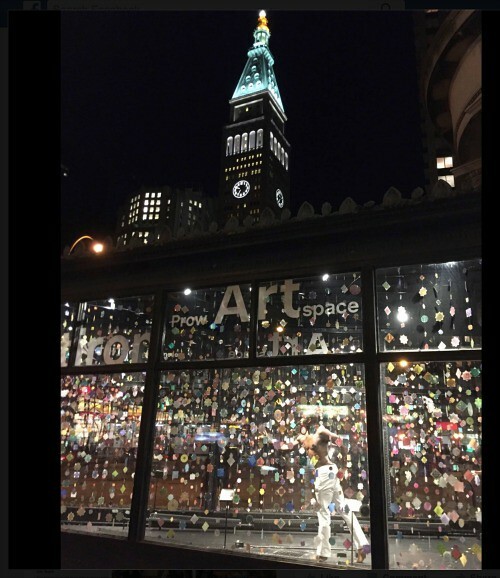 I became interested in learning more about Chelsea's work after spotting a photo of her installation, Flakes, that is on display through the end of winter in New York's iconic Flatiron Building. 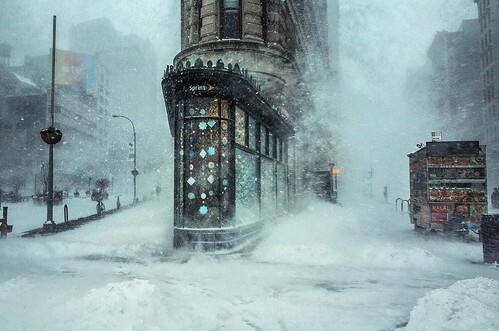 A bit of googling led me to a post on Colossal that featured stunning photos of the Flatiron intersection taken during the Jonas snowstorm by Michele Palazzo. It's an exquisite match-up... Chelsea's snowflakes meet the real thing, and how timely... the show's opening in the The Sprint Flatiron Prow Art Space exhibit (curated by Cheryl McGinnis Projects) coincided with the blizzard. 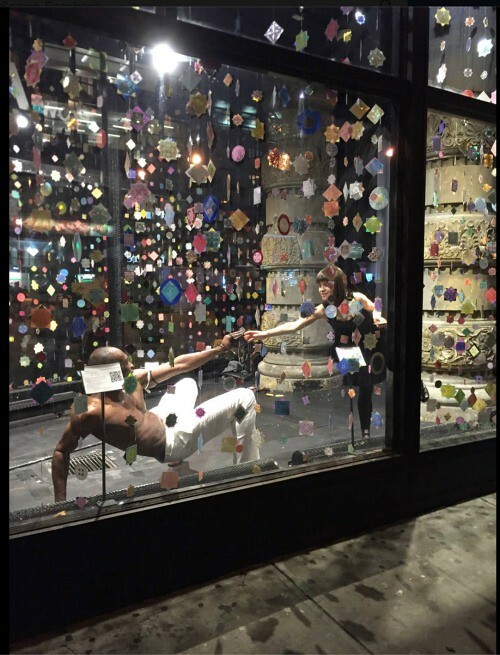 Cheryl McGinnis invited former Alvin Ailey choreographer and dancer Dion Wilson to further expand the dialog of art via a series of performances within the installation titled Dance Interprets Art. They have been seen and enjoyed by thousands of people. In one performance Chelsea worked with Dion to create a new form of art. She handed him flakes that he wore and worked with in the moment. Chelsea studied fine art and mathematics in college and enjoys the repetitive, meditative aspects of kirigami. She told me she folds and then uses scissors to freehand cut each square. The examples in the Flatiron installation include mirror paper and thin plastic for shine and protection. 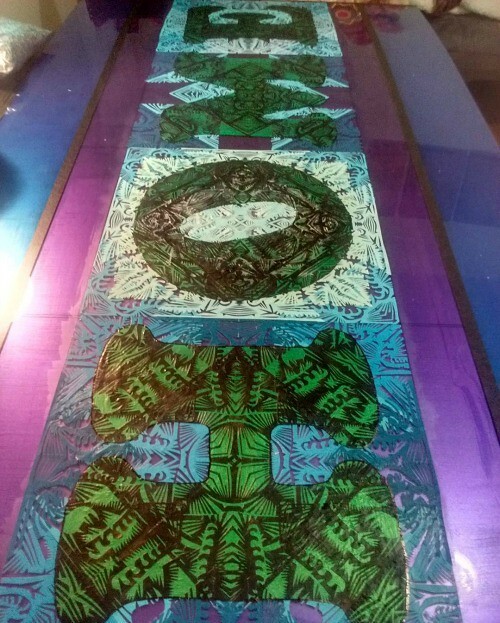 The piece below, in progress, is a mixed media collage... kirigami and acrylic paint on Plexiglas. 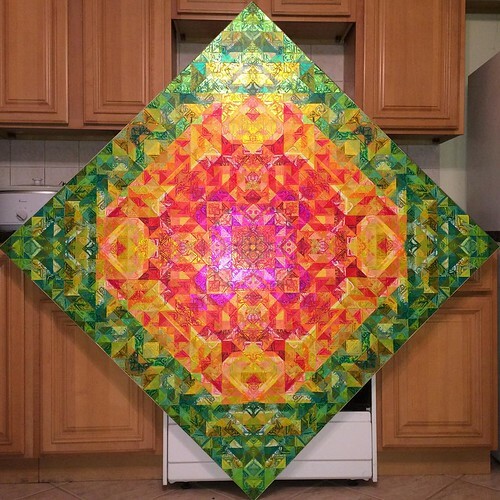 It is a commissioned project that will hang in the Montefiore Medical Center in the Bronx. Chelsea often upcycles materials she finds on the street. 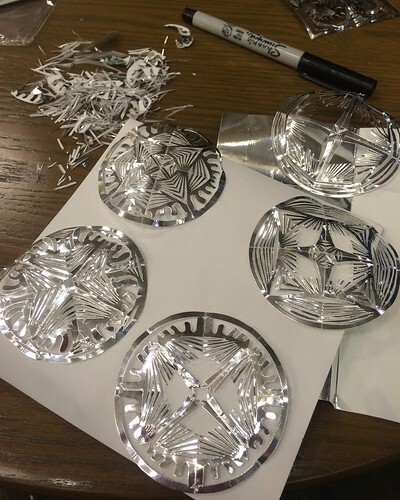 Glossy magazine pages are cut and assembled to create kaleidoscope-style patterns. 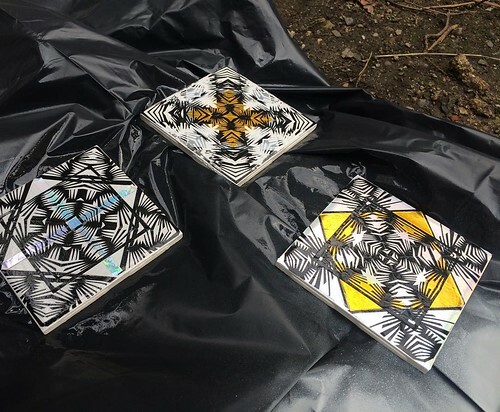 She uses Mod Podge to adhere cuttings to discarded ceramic tiles.... supplies might be basic, but the magic happens by combining colors and designs. Chelsea collaborated on the Spring 2016 fashion collection of Alexandra REBOUL. 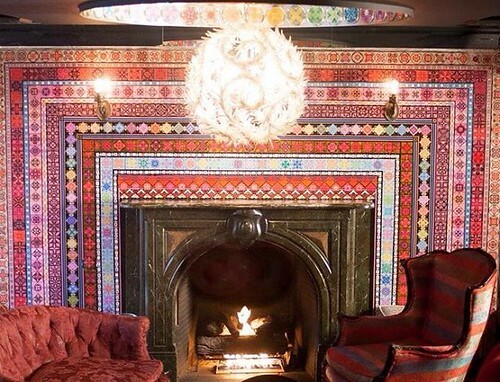 Her ornate kirigami can be seen at Cibar Lounge in Manhattan; this fireplace surround reminds me of Moroccan tile work. She created custom murals and lighting for the space. Chelsea can be contacted via her website [edit no longer available]. Watch for an upcoming exhibit in New York City at Chashama. All I can say is WOW!!!! these are truly amazing...thanks for sharing this, once again you have show cased people that take the creative process to new heights. So glad you enjoyed the post, Cate! Thanks for taking the time to comment.